Old Navy had their Give and Get sale this weekend, so I grabbed some more goodies off of the American website to have shipped home. I have to take advantage of this, because they have some items that we can't get here. It's too bad they won't ship from the US site to Canada. Booooo! The best part is that a percentage of the proceeds goes to charity. I think it is great that Old Navy/Gap/Banana Republic do these sales and give back! Anyway, I took the opportunity to grab up a few basics that my wardrobe was lacking. A lot of it is black, but I love to wear black during the cooler months and dress it up with colorful accessories and jackets. I picked out the black sequined dress to wear to my Christmas get-together that I'm having. I could live in sweater dresses, I swear. And I have no idea how I missed the fact that I had no plain black skirt in my wardrobe. I also bought a few items at my local Old Navy. I picked up an adorable purple ruffled dress to wear for Thanksgiving, which I couldn't find listed on the website. I might feature it in an OOTD later. 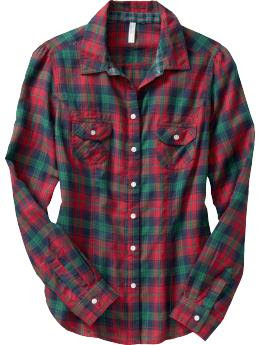 I also grabbed this plaid flannel shirt below. Word of advice on this shirt would be that it is made smaller than their usual shirts. A person with a bigger chest might need to order or buy a size up! I know a lot of my clothing hauls are from Old Navy, but I can't say it enough that they are a great place to shop for basics. The price is affordable and I find it to be better quality than a lot of the trendier places (cough...F21...cough). ;) And the more money I save on clothes, the more I can use elsewhere (cough...Sephora and MAC...cough)! Did any of you take advantage of the 30% off this weekend? It's amazing that we get a discount and that charity gets some too! @Mel- They do...to every other freakin' country but this one, it seems. LOL! We do have oldnavy.ca now that does ship here. Both sites have the same clothes and some different. It's just irritating that I can't get the stuff I like from the US one when they ship everywhere else. Bah humbug!